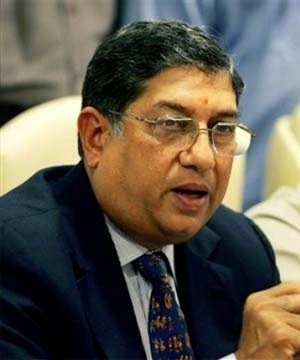 The Supreme Court of India has named four key individuals connected with Indian cricket, including ICC chairman and sidelined BCCI president N Srinivasan, and IPL chief operating officer Sundar Raman, in connection with a report into the 2013 IPL spot-fixing case, which, the court observed, had suggested several "misdemeanours". The court issued notices to the four who, along with Srinivasan and Raman, include Chennai Super Kings official Gurunath Meiyappan and Rajasthan Royals co-owner Raj Kundra. A special bench of the Supreme Court, comprising justice TS Thakur and FM Kalifullah, revealed the names during a hearing that lasted 20 minutes, and said that it would make the Mudgal report available to lawyers on both sides - BCCI/Srinivasan and the Cricket Association of Bihar - so that they can make their arguments when the next hearing takes place on November 24. The court said it had received the Mudgal committee investigation report, submitted in early November, and the findings recorded by committee are understood to have "indicted" some individuals whose conduct has been investigated. The report was presented in two parts - one of which featured players and the other which was made up of what Justice Thakur termed "non-playing actors in the drama." The names of three players was inadvertently taken by the judge before the court ordered their names be withheld. The four non-playing "actors" were however named and the court had decided to also provide them with a redacted version of the report, with the player names blacked out, in order to ensure that the four could defend themselves. The four persons named were given four days to file objections against any of the findings in the report pertaining to themselves. While counsel were present for the BCCI and Srinivasan, court notices had been sent to Gurunath, Kundra and Raman, to ensure that they responded in time. When asked by the BCCI lawyer about the court allowing Srinivasan to contest the BCCI election that are scheduled for November 20, Thakur said, "we cannot give clarity on whether you can contest or not until this matter is disposed of." The fate of the BCCI AGM and annual general elections is unknown. BCCI counsel CA Sundaram told the court that they would be postponed, again, for a month. Aditya Verma, the secretary of the Cricket Association of Bihar, urged the state associations to not defer the AGM. "Even after top officials of the BCCI have been named by the Mudgal report, why is the organisation not willing to go ahead with its AGM and name new officials? I request all state associations to not stand by this," he said in a press release. This specific case dates back to June 2013 when Verma raised charges of a conflict of interest in the BCCI's original two-member inquiry panel for the IPL corruption issue. A Bombay High Court ruling later termed the probe panel "illegal". The BCCI and the CAB filed petitions in the Supreme Court against this order, with the CAB contending that the Bombay High Court could have suggested a fresh mechanism to look into the corruption allegations. The Supreme Court then appointed a three-member committee, headed by former High Court judge Mukul Mudgal and comprising additional solicitor general L Nageswara Rao and Nilay Dutta to conduct an independent inquiry into the allegations of corruption against Meiyappan, India Cements, and Rajasthan Royals team owner Jaipur IPL Cricket Private Ltd, as well as with the larger mandate of allegations around betting and spot-fixing in IPL matches and the involvement of players.